While slow, and somewhat lackluster in features, this $349 device is mainly for beginners. XYZprinting has been making hay by offering some of the most affordable consumer plug-and-play 3D printers, shipping 30,000 of its da Vinci model machines last year. Its latest -- the da Vinci Junior 1.0 -- was released today and is the smallest and least expensive yet. Make no mistake, though, the da Vinci Junior 1.0 is for beginner makers. While it is a remarkable machine considering that it retails for just $349, it doesn't offer a lot of sophisticated features. The da Vinci Junior printing a spiral-design vase. While there are crowdsourcing campaigns offering sub-$400 3D printers, those machines have yet to hit the mass market. In light of that, XYZprinting isn't indulging in hyperbole when it calls its da Vinci Junior the world's most affordable 3D printer. Previously, XYZprinting's least expensive model was the da Vinci 1.0, which sells for $499. First announced in January, the da Vinci Junior includes some great features for first-timers. 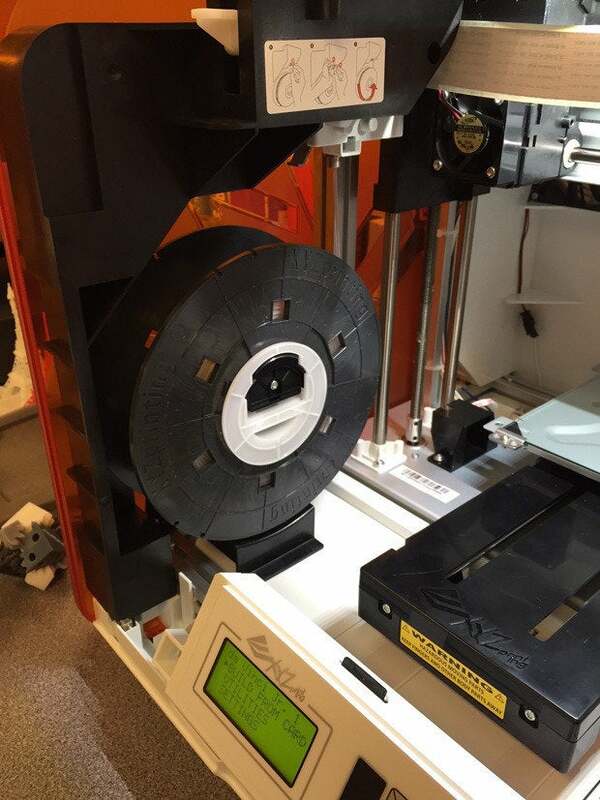 Unlike some of XYZprinting's previous machines, the thermoplastic filament in this machine loads on a spool versus a pop-in cartridge, which makes reloading filament easier when it runs out. The machine has a one-click fast release extruder for simplified cleaning. It's truly a plug-and-play 3D printer, requiring no assembly or complicated setup like some other machines. While XYZprinting's machines are easy on the budget, the company has adopted the 2D printing world's model of proprietary ink, or in this case, filament. Whether in spool or cartridge form, XYZprinting's filaments are monitored through a microchip that uses near-field communication (NFC) to transmit information to the machine. When the cartridge runs out, the machine can no longer be used until it's refilled by XZYprinting or a new spool or cartridge is inserted. Spools of the popular polylactic acid (PLA) filament, the only type the da Vinci Junior 1.0 uses, aren't terribly expensive: a 1.8-lb spool costs about $28. With that amount, you can print scores of objects. Another cool feature of PLA filaments is that they're biodegradable and melt at lower temperatures, so they require less power to use. The da Vinci Junior uses a filament spool rather than a self-contained cartridge as other XYZprinting models have. Printer setup is a cinch; you just remove some Styrofoam protection around the print head and platform, hang the spool of filament on an inside hook and feed the filament into the print head. Then you just select "load filament" on the menu and you're ready to print. While it's the least expensive of the da Vinci lineup, the Junior still has many of the features of its larger brethren, including an LED-menu for selecting various functions such as nozzle cleaning and energy save mode to turn an internal light off. Unfortunately, my da Vinci Junior arrived improperly calibrated -- the printer head was too tight against the print bed, making it impossible for it to extrude filament. That issue may have resulted from the shipping process or during setup at the factory. XYZprinters' machines are designed in Taiwan, but manufactured in Thailand. Regardless, the fix was rather simple. I used the machine's control and display panel to readjust and raise the nozzle-to-print-bed clearance by about 1.2 millimeters. It worked fine after that. While the da Vinci Junior uses a spool versus a cartridge for filament, the spool spindle still has a tracking chip to let the user know when the machine is running low. What I love about XYZprinting's da Vinci line of machines is they're enclosed in attractive, transparent, sound-muffling cases. Believe me when I say that open-air 3D printers can be loud. This one is relatively quiet and I had no problem concentrating on my work as it went merrily on its way printing objects on the desktop next to me. Of the four 3D printers I've reviewed to date, the Lulzbot Mini was the fastest and the most accurate. While it lacked onboard storage, and was by far the noisiest, its ability to construct objects quickly and accurately placed it in the lead. As a result, the Lulzbot Mini remains my current benchmark for judging rival printers until a better one comes along. Prior to this latest XYZprinting machine, I'd reviewed the da Vinci 1.0 AiO all-in-one 3D printer, which nearly threw my back out when I pulled the 60-pound machine from its shipping box. That printer is also about 18-in. x 20-in. x 22-in. in size. To my unpacking delight, the da Vinci Junior weighs only 26.5 lbs. and fits nicely on a desktop: It's just 16.5 x 14.9 x 16.9 inches. But, with reduced size comes a smaller build area. While the da Vinci 1.0 has a build area of 7.8-in. x 7.8-in. x 7.8-in., the da Vinci Junior's build area is nearly two inches smaller at just 5.9-in. x 5.9-in. x 5.9-in. The most stringent test I've found so far for 3D printers is to create a six-inch high model of the Eiffel Tower. The Tower's intricate scaffolding has befuddled every machine but one. Some machines come close, demonstrating they can produce some details; other machines failed completely with the Tower ending up a bird's nest of filament. The da Vinci Junior also failed rather spectacularly. The resulting model (see high-speed video below) had the form of the tower, with virtually none of the details intact. Part of the issue with imprecise object replication is software and part of it is the da Vinci Junior's resolution, which ranges from 100 to 400 microns or .1 to .4mm. The last machine I tested was the Lulzbot Mini, which had a resolution of 0.05mm to 0.50mm. But, that was a $1,350 machine. It printed the Eifel tower in impressively accurate detail. The da Vinci Junior, however, has the same resolution as a $2,900 Makerbot Replicator desktop printer. So it's not inferior to some popular 3D printer models, but it also doesn't stand out. Just remember: It's only $349. The da Vinci Junior is controlled by the same software as other models -- XYZWare. I've found the software to be generally unsophisticated and lacking in functionality. XYZWare allows very basic position manipulation of an object once loaded onto the virtual print bed and it offers the ability to scale the object's size. You can also add multiple 3D model files to a single print job as long as they don't exceed the max print volume, but I found it nearly impossible to move individual objects around the print bed in order to make them all fit. You won't be able to dissect a print job and inspect it layer-by-layer to ensure quality. You have no control over how much support material is applied to specific areas of an object that has protruding or precarious features. 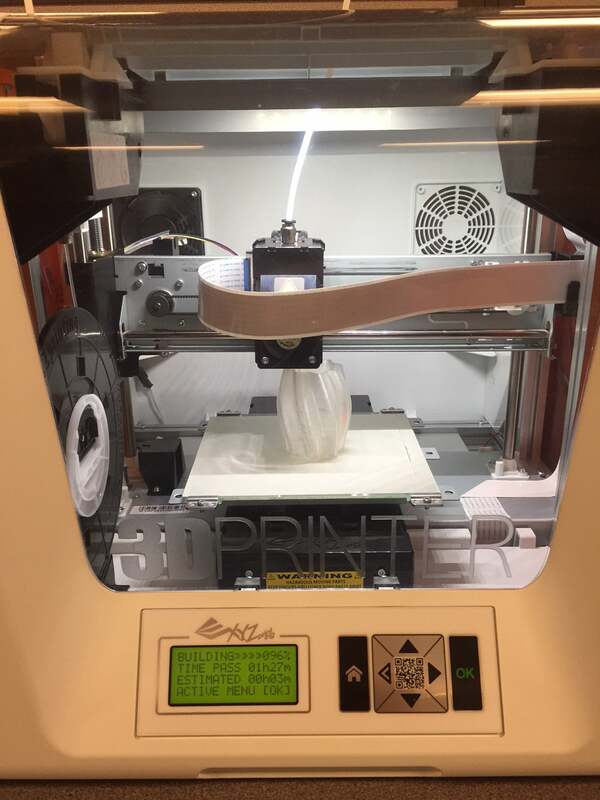 Adding support material ensures features don't droop or fail while being printed. You can choose from three quality levels and five smoothness levels. The da Vinci Junior is a slow machine. It took three times as long -- an hour and a half (1:32 hours to be precise) -- to print an octopus figurine that was just 3-in. in diameter and about 1-in in height. That compares to the Lulzbot Mini, which needed just 30 minutes to produce the same figurine. Just uploading .stl files from my laptop to the SD card in the da Vinci Junior to print proved at times to be a lengthy process. A simple origami-styled rabbit no more than four-inches in height took more than five minutes to upload. Part of the issue is likely that the da Vinci Junior uses USB 2.0, which is 10 times slower than today's USB 3.0. The origami rabbit then took one hour, 44 minutes to print. The da Vinci Junior's LED-function display and cursor keypad. One of the design features I liked about this printer is that it uses an SD card for onboard object file storage. Unlike other 3D printers with fixed onboard file storage, the da Vinci Junior allows the user to upgrade capacity if need be or to carry around multiple SD cards with various designs. Once the design is uploaded, you can also unplug the USB cord from your computer and be on your way. Some objects I was able to create with the da Vinci Junior 3D printer. Other manufacturers require that a PC or Mac remain connected to the printer until a job is completed, using the external storage of the computer. One of the attributes of a great 3D printer is the ease with which objects can be removed from the printer platform once they're finished. Perhaps it's because XYZprinting was cutting corners, but the most annoying feature of this printer is that you're supposed to affix a piece of one-sided sticky paper to the glass print platform. This is supposed to make objects easier to remove after print jobs by keeping them from sticking to the glass. The sticky paper is like masking tape, and when you attempt to remove it after its worn out, it comes off in shreds. What's worse, the tape does not help with removal of objects. You'll still be scraping around the edges of a piece with a putty knife until you dislodge enough of it from the platform to remove it. You'll end up breaking more than one piece in your efforts. Clearly, this is not the best concept XYZprinting's come up with to date. This printer also doesn't have a heated print platform, which XYZprinting says is "safer." But I've never burned myself on a platform; they're just not hot enough. What heated platforms provide is superior adhesion while an object is being printed; in basic terms, they keep the edges of a printed object down and flat. The da Vinci Junior is compatible with Windows 7 or above PCs and Mac OS X 10.8 64-bit and above systems. Overall, the da Vinci Junior is a remarkable machine considering its price. It won't blow you away with accuracy and functionality, but if you want to dip your toes into the world of 3D printing, making Lego blocks, simple figurines and mobile phone cases, you'd be hard pressed to find a better machine for the price.